Developer Alex Sapir has unveiled prices at his boutique luxury condo project in Surfside. Units start at $10.2 million and go up to $40 million at Arte by Antonio Citterio, a 12-story, 16-unit building at 8955 Collins Avenue. Sapir’s Sapir Corp. said it is officially launching sales of Arte now, about four months after launching during Art Basel Miami Beach, according to a spokesperson. Corcoran Sunshine is handling sales and marketing. Units will range from three to five bedrooms and from 3,150 square feet to 7,550 square feet. Citterio, an Italian architect, is known for designing Bulgari and Mandarin Oriental hotels. 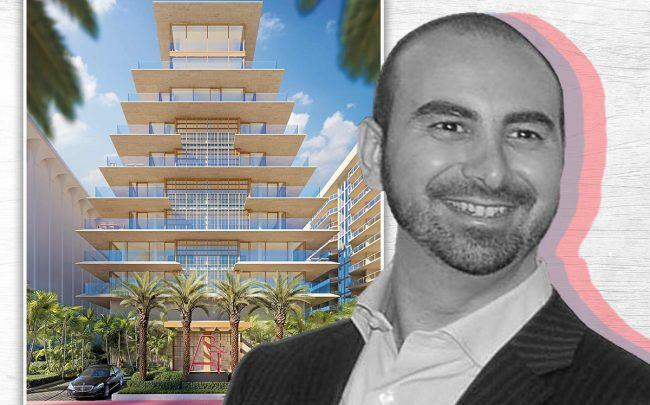 Sapir sold two units priced at a combined $20 million on the eighth floor to his mother, Bella Sapir, and his sister, Ruth Sapir-Barinstein. The firm, a publicly traded company on the Tel Aviv Stock Exchange, sought shareholder approval of the deal earlier this week to fund construction costs tied to completing the building. The waterfront development is near the Four Seasons Hotel and Residences at The Surf Club. Arte will have about 75,000 square feet of sellable condo space, an outdoor pool, indoor lap pool, a spa and fitness center, a tennis court, residents’ lounge and air conditioned parking. The building will also have original artwork from Robert Indiana, who created the LOVE sculptures. Arte marks Sapir’s first project in South Florida. The developer also has plans for a 1.7 million-square-foot mixed-use complex in Miami’s Arts & Entertainment District, called Miami 18. The developer financed construction of Arte with a $90 million loan from Bank Leumi USA in 2017.